I’ve been back in the US for the last week working on the Reclaim offices, and it’s been a lot of fun. The last two days the whole crew has been working together in the new diggs, and the vision of the office, co-working space, maker space, and 1980s video rental store is coming together nicely. 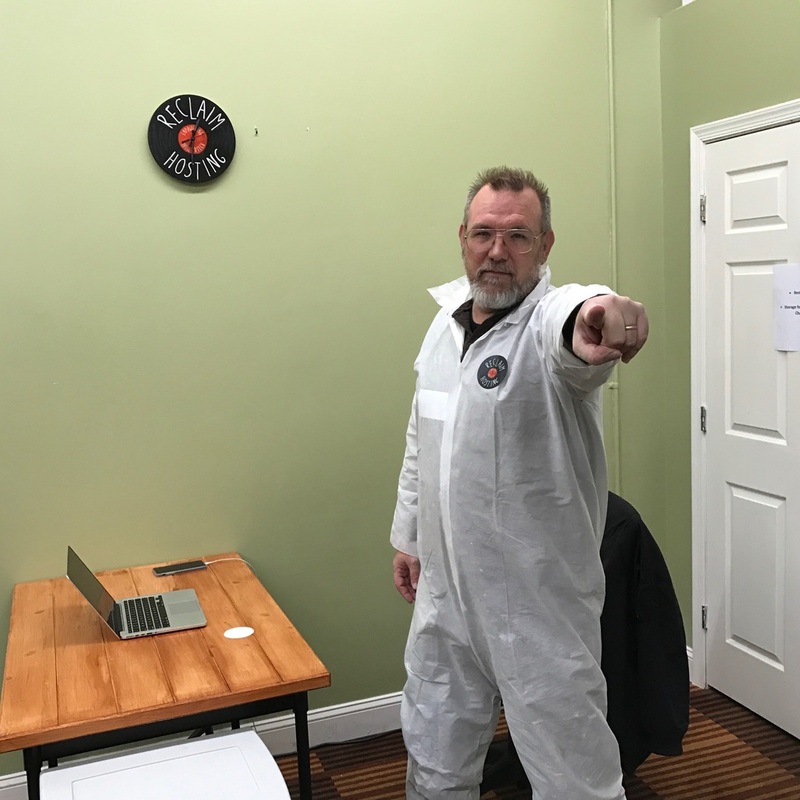 Tim and I did some work installing ceiling tiles, hooking up recessed lighting, painting paneling, and laying carpet tiles in a small back office while the major construction work continues in the main area. Considering we’re two web hosting sysadmins, it went pretty well and relatively fast. In fact, the room is almost done. I’ll save the before and after images for later this week when all the furniture is in and the final ceiling tiles are done. But in the meantime I wanted to share a quick action photo. 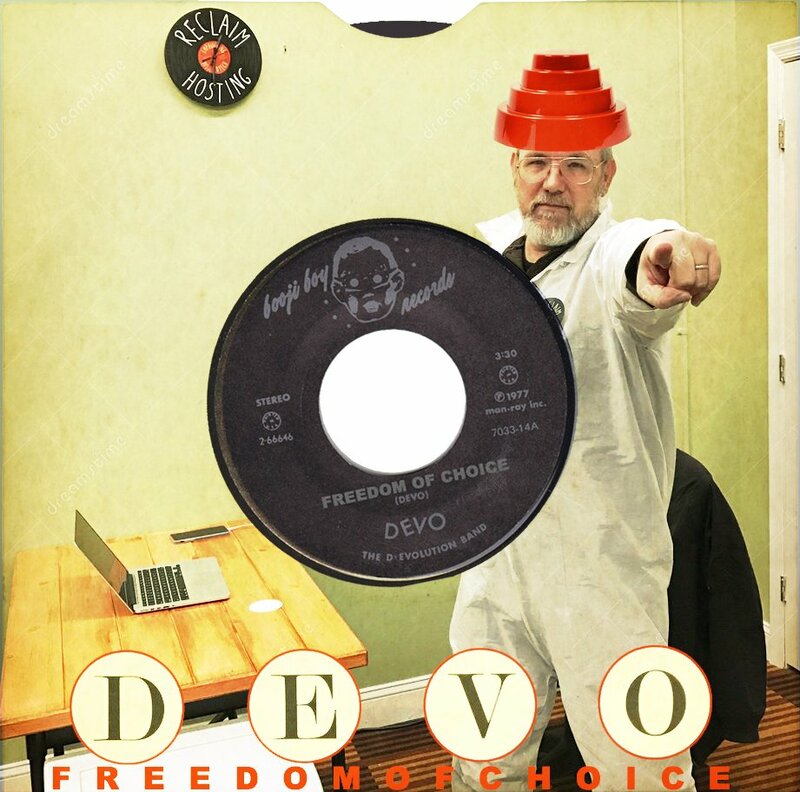 I also started calling the suit I was wearing a Devo Suit to pay respect to the awesome style sense to America’s greatest New Wave band from Akron, Ohio. I even put a Reclaim Hosting sticker on my heart in order to seize the marketing opportunity. After Tweeting the image, it came back to me as the best album cover I have seen in a very, very long time! Paul Bond is no joke, and he was even attentive enough to incorporate Booji Boy, a character created by the band and the name of their early independent label. I never tire of the remix engine that is my Twitter community. Solid gold! This entry was posted in reclaim and tagged devo, reclaim. Bookmark the permalink. 1 Response to Are We Not Reclaim? Maybe there is a future tv show like all the house hunting ones where you and the team go around reclaiming and spiffing up domains.